The IQ Series redefines the X-style keyboard stand, bringing a new level of stability and innovation to the lightweight, gigging-minded design. Offering a range of height settings for sitting-to-standing playing comfort, the IQ-2000 features Ultimate Support's patented Memory Lock system and unique stabilizing end caps, giving keyboardists timesaving onstage luxuries along with peace of mind. IQ Series stands hold true to Ultimate Support's twofold commitment - providing uncompromising instrument stability while remaining at the forefront of musician-centric, innovative design - and are ideal for supporting everything from lightweight synthesizers and MIDI controllers to the heaviest of professional keyboard workstations. Equipped with the IQ Series' patented Memory Lock System, the IQ-2000 offers a set-it-once solution that saves gigging and on-the-go keyboardists time and energy. After initially choosing a preferred height position, the Memory Lock opens the stand to the desired height every time. Keyboardists need only to lift and place their instruments once. More than offering six height positions that comfortably accommodate a range of sitting and standing positions, the IQ-2000 features an inventive off-set bracing system. 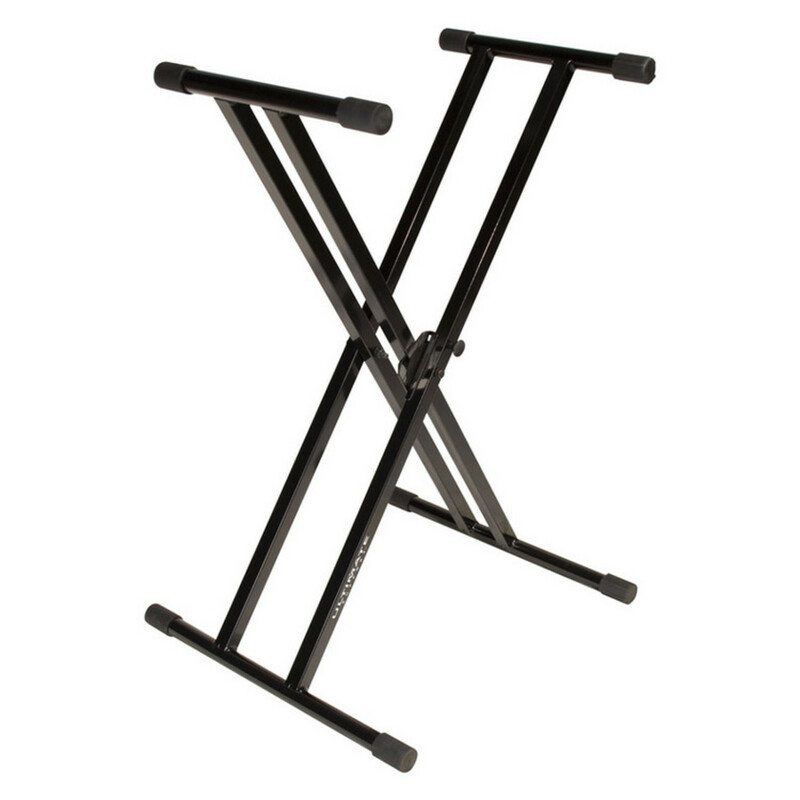 This design feature gives keyboardists more knee room than any other double-braced stand, ensuring that the stand is out of the way and that only the keyboard is in focus during performances. The IQ-2000's integrated stabilizing system accounts for potentially uneven surfaces at future gig or jam locations and effectively combats potentially instrument-threatening rocks and wobbles. Located on the upper and lower tubes, two rubberized end caps easily rotate, revealing incremental thicknesses to correct the problem. In addition, thick rubber sleeves secure the keyboard on the upper tubes, while keeping the IQ-2000 firmly in place.